See below for descriptions and maps to help you find the most convenient departure points. Note that not every departure point is served on every tour. See each single-day or multi-day tour description on this site for a list of the departure points served on that particular tour (not all departure points may be listed). You may also go to our search page to find tours that include the departure point(s) you prefer. *All parking is at your own risk and Good Times Travel assumes no responsibility for vehicles. *A parking permit may be required at some locations (noted below). *If you have a group of 10 or more, it may be possible for us to pick you up at another location that's more convenient for your group members. Park and board the motorcoach at LBP/La Bonita Park located at 1440 Whittier Blvd., La Habra, CA 90631 OR La Habra Marketplace, 1801 W. Imperial Hwy. Behind Sprouts (see each tour for departure location). Conant Lot/Lot "O" at 4900 Conant St. at Long Beach City College. The lot is located near the corner of Clark St. and Conant St., across Conant St. from Veterans Stadium. Park in the spaces on the west side (closest to Lakewood Blvd.) of Building "O". Passengers are permitted to park in "Staff" spaces but not in "30 minute" spaces. DO NOT PARK IN FRONT OF BUILDING "O". A Good Times Travel-provided permit (provided by your tour director on the day of the tour for single-day tours or with your final tour documents for multi-day tours) is required to park here. Park here for all multi-day tours and single-day tours that depart on Saturday, Sunday or on a holiday. All weekday (non holidays) tours depart from VS. Pick-up is at the southeast corner of the campus adjacent to parking lot E6 at the intersection of Palo Verde Ave. and E. Anaheim Rd./E. State University Dr. Parking location and purchase of a $9 parking permit at the kiosk (cash only) located in the Foundation lot (FND) which is directly across E. State University Dr. If parking is unavailable in the FND lot, you will need to park in lot G13 or G14 which are north on Palo Verde Ave. and also require a $9 permit. Passengers with a handicap placard can park in the green spaces along State University Dr. or in lot E6 as well. Good Times Travel office at the corner of Warner Ave. and Magnolia St., next to CVS Pharmacy. Park in the lot behind our office adjacent to La Paloma St. Board the motorcoach directly in front of our office. A Good Times Travel-provided permit (provided with your final tour documents) is required to park here for all multi-day tours. Park in Student Lot B (Upper Lot) off Mountain St. near the 2 Freeway at Glendale Community College in Glendale. Wait and board the motorcoach near the Police Station located at the southeast corner of the parking structure just west of Lot B. One-day parking permits ($3) are required 7 days a week and may be purchased at the dispenser in this lot. Do not park in "staff" or "reserved" stalls. Park and board the motorcoach in Parking Lot 6 on the west end of the Technology Building at 1111 Figueroa Place, Wilmington, CA 90744. Please plan to arrive 20-30 minutes prior to departure to purchase your parking permit at the kiosk (dollars and quarters only). Please note parking for this departure point is for single-day tours only. This is a pick-up location ONLY for multi-day tours. 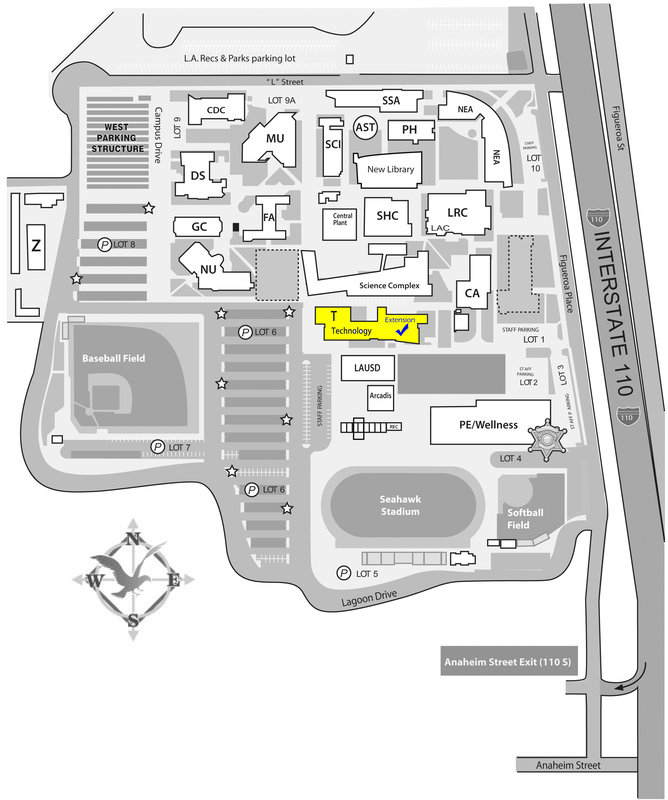 Overnight parking is available at our CON location at Long Beach City College. Take exit 9 for Crenshaw Blvd. and turn right onto Crenshaw Blvd. Just after Macy’s turn right onto Martin Luther King Jr. Blvd. Turn right into the Macy’s parking lot and park on the right on the west side of Macy’s (you will see signage for the African History Museum on Macy’s storefront). Park and board the motorcoach in Parking Lot 8 which is off of De Soto Ave and El Rancho Drive. Parking permits are included with registration. LBCC-D / Long Beach City College Lot "D"
Long Beach City College Lot “D” is located at 4813 Harvey Way in Long Beach and is north of Carson St. and immediately west of Faculty Ave. and the Long Beach City College bookstore. A Good Times Travel-provided permit (provided by your tour director on the day of the tour) is required to park here. Park here for single-day tours that depart on on the third Sunday of the month only. Enter the east side of the Laguna Hills Mall from Avenida La Carlota (adjacent to I-5 and near the former JCPenney). Park in the spaces next to the large white sign that reads "Coming Soon - Five Lagunas." A Good Times Travel provided permit is required to park here for multi-day tours. Park at Clubhouse 3 located just past Gate 3 at 23822 Avenida Sevilla, Laguna Woods, CA 92637. Proceed to the bus stop adjacent to security booth to board the motorcoach. A Laguna Woods Village "pass" is required to park here. Good Times Travel is not authorized to grant permission to enter Laguna Woods Village. All Friends of Oasis tours depart from NCCC/Newport Coast Community Center at 6401 San Joaquin Hills Rd., Newport Beach, CA 92657. Park in Pasadena City College Student Lot #4 parking structure and board the motorcoach in the adjacent Student Lot #3 (directly west of Lot #4). Both lots are located near the corner of Hill Ave. and Del Mar Blvd. in Pasadena. A complimentary parking permit (provided by the PCC Extended Learning office) will be provided to park here for multi-day tours. One-day parking permits ($2) are required 7 days a week and may be purchased at the dispenser in this lot. The Pasadena Senior Center (PSC) is located at 85 East Holly Street, Pasadena, CA 91103. Parking is available on a first-come, first-serve basis in the PSC lot lot just to the east of the Center, off Holly Street. A parking structure at Holly & Arroyo (one block east on Holly Street) is also available. Parking in this structure is free when validated by the PSC. Membership in the PSC is required for validation. Board the motorcoach in front of the Pasadena Senior Center. Park and board the motorcoach in Parking Lot #1 at Saddleback Community College. Lot #1 is located on the east side of campus (Avery Pkwy entrance). One-day parking permits ($5) are required 7 days a week and may be purchased at the dispenser in this lot. A Leisure World “pass” is required to park here. Good Times Travel is not authorized to grant permission to enter Leisure World. VS Veterans Stadium Lot, Long Beach City College. Enter the lot from Conant St. between Clark St. and Lakewood Blvd. Park in stalls located directly in front of the backside of the stadium scoreboard. A Good Times Travel-provided permit (provided by your tour director on the day of the tour) is required to park here. Park here only for single-day tours that depart Monday thru Friday except for holidays. Weekend and holiday tours as well as all multi-day tours depart from CON. All day tours depart from the Ken Edwards Center - 1527 4th St, Santa Monica, CA 90401, 2nd floor. Parking is free, but does require validation from WISE & Healthy Aging, day of the tour.